space either on the same level as the garage or above the garage. With garage apartment plans, the garage varies in size from a 1-car garage to a 3-car garage with some bays large enough to accommodate an RV or a boat. Below is a list of eight garage apartment plans that are easily overlooked in our collection. Take some time to review these plans and find out what makes them special. 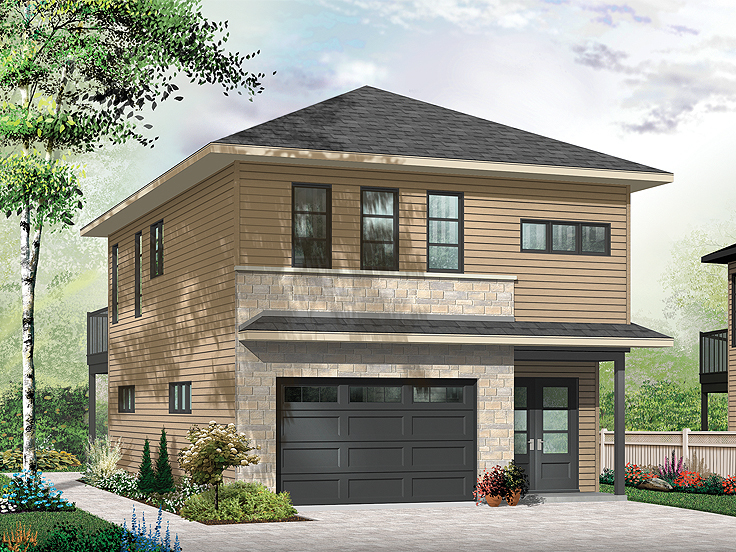 006G-0106 – This stylish 3-car garage apartment plan is designed to fit on a sloping lot. With the garage bays tucked into the hillside, the living quarters can be accessed from stairs in the garage or you might wish to add just a couple of steps leading to the optional deck and enter the living quarters from ground level. 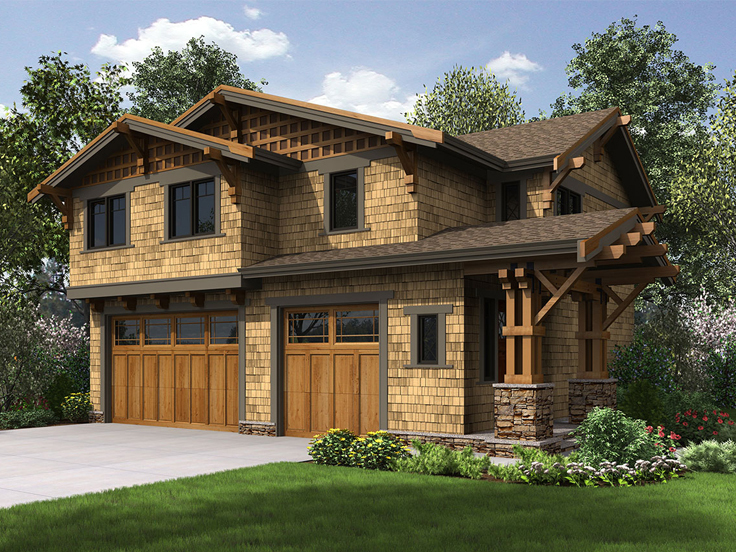 In addition to being well suited for a hillside, this garage apartment plan makes the ideal vacation home. With all the windows in the vaulted living room and the optional deck, this design is ideal for a lot with a view. Just imagine looking out from the mountain side or overlooking a beautiful lake! ll find a single garage bay that is accessed on the side. The extra bay is perfect for your weekend car! However, if you want to rent out the second floor apartment for additional income, your tenant can use the 1-car garage, and you can park your cars in the 2-car garage. Don’t miss the handy workshop! The living quarters feature a spacious great room, eating bar, and a stackable washer/dryer unit on the main floor. 012G-0047 – If you’re looking for a flexible design, this is on the one for you. In addition to the 2-car garage, this garage apartment plan features two carports, perfect for boat storage or of use as a grilling porch and just plain relaxing. The workshop accommodates the family handyman. Upstairs, the finished living space can serve as your art studio, workout room or home office, but when guest arrive, it can double as a living space for weekend visitors. A spacious bedroom and full bath complete the second floor. 027G-0011 – Efficient living with modern flair describes this stunning garage apartment plan! The garage floor plan offers a 1-car garage with storage in the rear. Don’t miss the rear overhead door making it easy to access the lawnmower, an ATV or motorcycle without having to back the car out of the garage. A utility sink and counter offer extra convenience. Upstairs, modest living quarters feature one bedroom, on bathroom, and an open floor plan anchored with an island and snack bar. A rear deck is ideal for those who enjoy grilling or relaxing outdoors. If you’re looking to add extra parking and living space to your modern home, this garage apartment design will compliment it well! 032G-0007 – As simple on the inside as it is on the outside, this 2-car garage apartment plan is designed for flexibility. The garage level can serve as extra parking, storage or a workshop depending on your specific needs. On the second floor, the finished living space is a flexible studio. With a kitchenette and a full bath, it works well as a guest suite, or it can provide that much needed home office or music studio that you don’t have room for in the main home. Or maybe this design will better serve your college student providing a quiet place to live and study without leaving home. 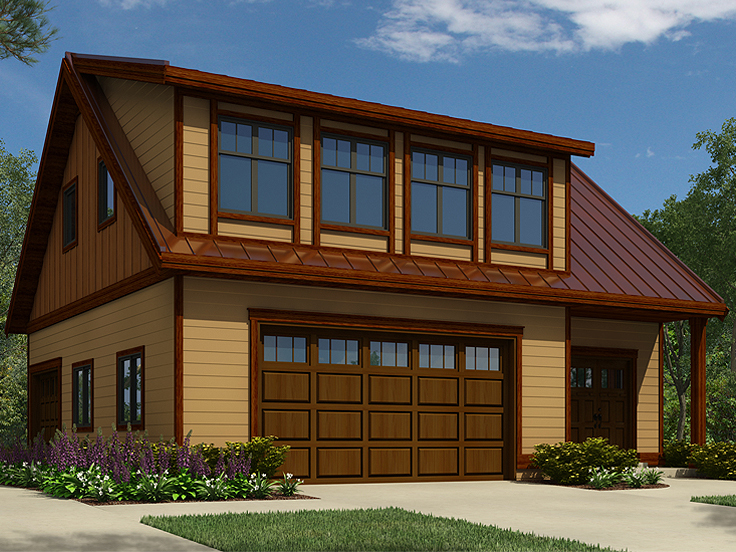 035G-0023 – This Craftsman-style garage apartment plan begins with a 3-car garage designed with extra deep bays. They are perfect for boat storage and oversized trucks and SUVs as well as other things. The apartment is a bit unusual in that it offers three bedrooms. This feature is uncommon among garage apartment plans making this design an excellent choice for a weekend getaway. You have room to store your boat, kayak, canoe or ATV in the garage and you have a space for the kids or friends to join you when it is time to get away from it all for a while. The living areas are spacious making it easy to gather, entertain or relax. 051G-0079 – Are you looking for a garage apartment plan that will provide your aging relative with independent living while still living close to you? This one-story garage apartment plan offers private living space for your loved one outside your home, but neatly tucked in your backyard. This keeps loved ones nearby in case of emergencies, while allowing them to still live as independently as possible. As our loved ones age, we worry about them falling or needing assistance and not being able to get in touch with us. On the other hand, they worry about us thinking they are no longer able to live alone. This garage apartment design is the ideal solution offering the best of both worlds. The living quarters offer a modest kitchen and comfortable great room, plus a generously sized bedroom and full bath with laundry facilities. If your loved one still drives, there is one garage bay beside the living quarters for them, plus an extra one for you. And the best thing is the 2-car garage has extra deep bays, ideal for boat storage or there is room in the rear for a small workbench or storage space. 053G-0013 – Here’s another 3-car garage apartment that delivers plenty of parking plus flexible living space. 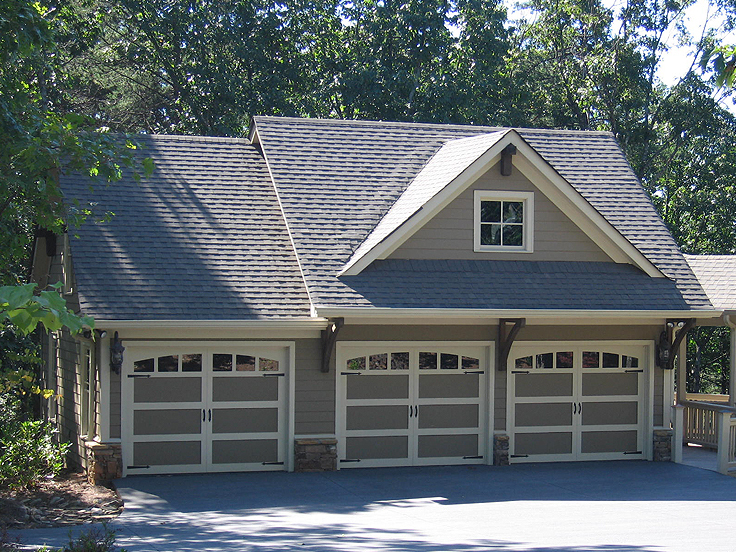 For those with a growing family fleet, a detached garage plan delivers extra parking and storage space. It is perfect for additional family cars, or other items like golf carts and ATVs, the family bikes, recycling bins or maybe a workshop. The second floor offers a studio apartment with full bath and galley kitchen. It is just right for your college student or rental property for those looking to earn a little extra income. If you prefer, finish the second level as recreation room, hobby area or home office. Furnished with a pull out couch and a few other basics, it can easily convert to a guest suite when weekend visitors arrive. Though the basic nature or garage apartment plans is the same no matter the design, it is easy to see with the variety of floor plan we offer that there is something for everyone. And after you’ve considered these designs that you might have missed, take some time to browse our entire collection of garage apartment plans. Do you folks have other plans that look as nice as this one? Looks like a regular house but is really just a 1/1 apt above the garage. You can view all of our garage apartment plans by visiting http://www.thegarageplanshop.com. Simply select “garage apartment plans” in the plan style drop down or you can further narrow your search by using the quick search feature or our advanced search.